As we continue on our series about old Hollywood lighting, another great classic type of lighting is Split Lighting. This is something that has been used for several decades and can really add a dramatic effect to your images! 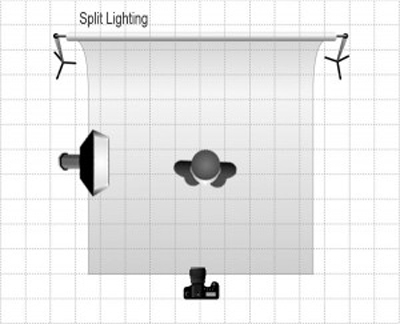 With Split Lighting the technique is to have only one light source and it is placed at a 90 degree angle from your subject and your subject is facing directly towards your camera. This type of lighting is definitely meant to help create a mood and add drama to any photograph. It is not really used much for any traditional portrait work but has been used quite often in commercial and fashion photography over the years. Once you start to experiment with Split Lighting you can then begin to add that fashion feel to your boudoir images. Position your subject’s head 90 degrees from the light but let their body move towards the light. This will give you the dramatic effect on their face while lighting up their body. With learning about the classic lighting techniques the thing to remember is that once you learn the rules then you are allowed to break them! With a good understanding of lighting you can really expand your imagination and start combining different variations of posing and lighting techniques! All this does is add more tools in your photography tool box!